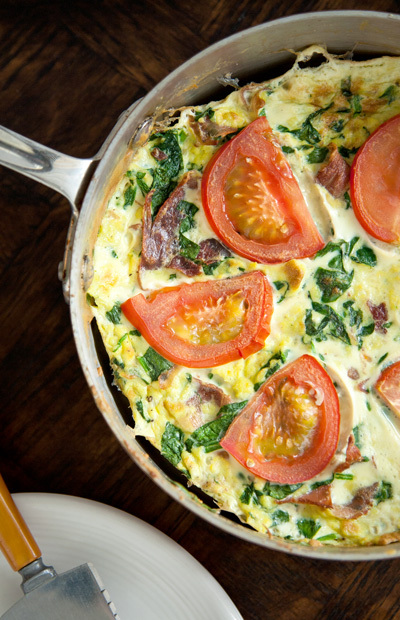 Frittatas are one of my favorite ways to eat eggs: because they’re versatile enough to use up practically any odds and ends in your fridge, because it’s shocking how many veggies you can fit in there, and because of how gloriously simple they make cooking and cleaning – all it takes is ONE PAN! This is how it begins: I had most of a pack of prosciutto left over after using a couple of slices to flavor a batch of veggie-packed minestrone soup. 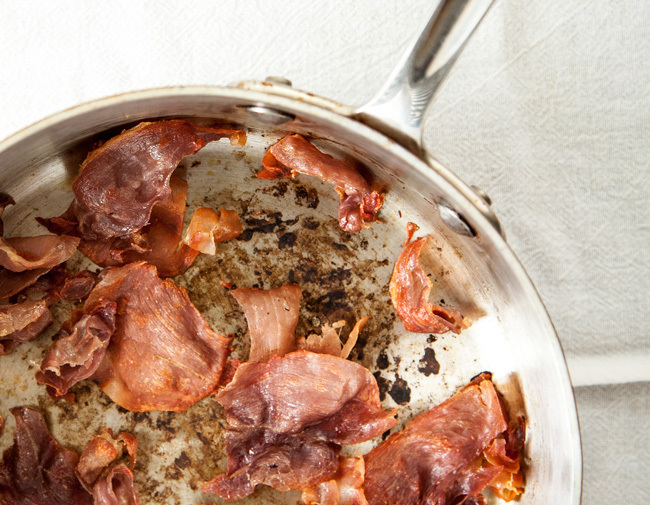 Get a load of that crispy prosciutto… Like bacon, but fancier! Be aware that prosciutto is typically very salty, so don’t add any salt to this fritatta while cooking, and be mindful if you choose to add cheese. Parmesan or feta would be too salty for my taste here, but a few dollops of mild creamy goat cheese may be just right. And don’t forget my go-to frittata filler: lots and lots of greens! 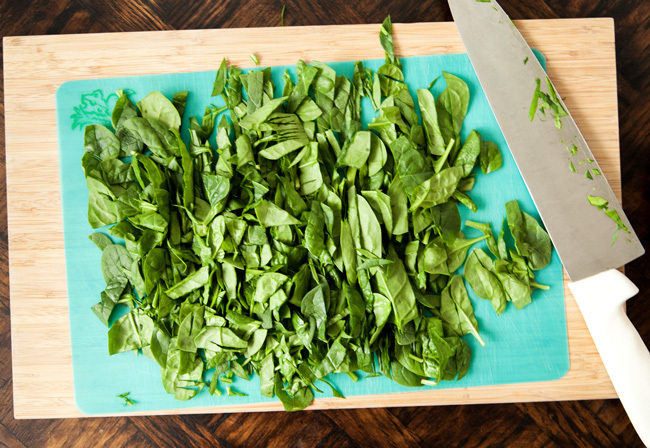 I ran a knife through this pile of baby spinach to make these mini-bite-size ribbons, but if you’re short on time just dump it all in! Spike it with a handful of fresh basil, and add all of the greens at the same time as the eggs. I used a mixture of whole cage-free eggs and packaged egg whites this time, but use whatever you like best. After gently stirring and cooking the eggs until they’re most of the way done, one trick I like to use is to pour a little extra egg on top to create a nice even surface (this is optional; mostly just for looks!). Then just top with tomato slices and throw that thing under the broiler to finish! That’s all there is to it – now you have a warm and tasty meal with lean protein and plenty of veggies! 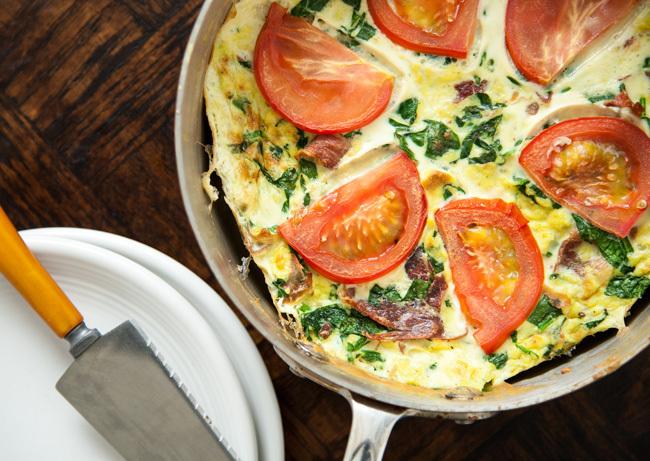 Serve the frittata on its own if you’re feeling minimal, or round things out with a chunk of sourdough bread or some breakfast potatoes. I bet you’ll like these greens and eggs and ham, whether you’re in a boat or with a goat, or whatever the heck you do with your free time. Enjoy it! In a medium bowl, whisk together the eggs, then stir in the spinach, basil, and a sprinkle of black pepper. Set this mixture aside. 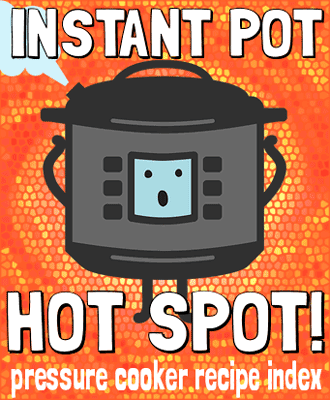 Heat the olive oil in a 10-inch oven-safe skillet over medium heat. Add the prosciutto, a few pieces at a time, and allow them to crisp in the pan. When they cook, they shrink significantly, and you will be able to fit more slices. When all of the prosciutto is crispy, reduce the heat to medium-low and begin preheating the oven's broiler..
Add the egg mixture to the skillet and gently stir to combine. Continue to cook and gently stir the mixture until the eggs are mostly cooked but still a little wet. If desired, top with a little more egg mixture to create an even surface, then arrange the tomato slices. Transfer the skillet to the broiler, and cook until the top is golden and the eggs are firm. For best results, allow the frittata to rest for at least 5 minutes before slicing.